I'd like to take you on a brief virtual journey to Scoop de Ville in Philadelphia. Located in the center city area, not far from Rittenhouse Square, it's painted with very bright ice cream cones all over. Maybe just-this-side of garish, but in a pleasant way. Dessert should never be a halfhearted experience, after all. Here's the interior (photo from the Scoop de Ville facebook page): After you walk in, you'll ogle at bright and sparkly stuff on the walls for a few minutes; then you'll make your way to the menu. It is a large menu. 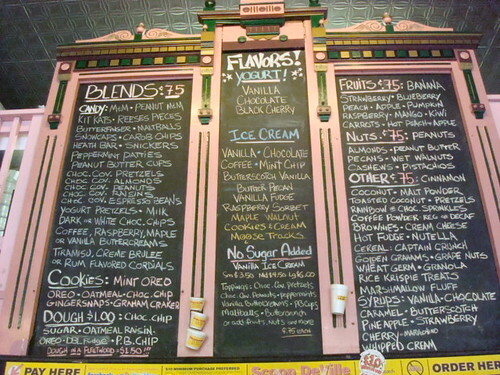 After looking through the mind-boggling menu of delicious ice cream (they get their ice cream from Bassett's), it's time to settle on the flavors you'd like to go with. For me, the answer was clear: butterscotch vanilla. After you choose a flavor, if you'd like something mixed in, they will take your ice cream, and your topping...and drill it into submission with this machine. What happens in the machine (other than the fun aspect of "We're playing with ice cream machinery!") 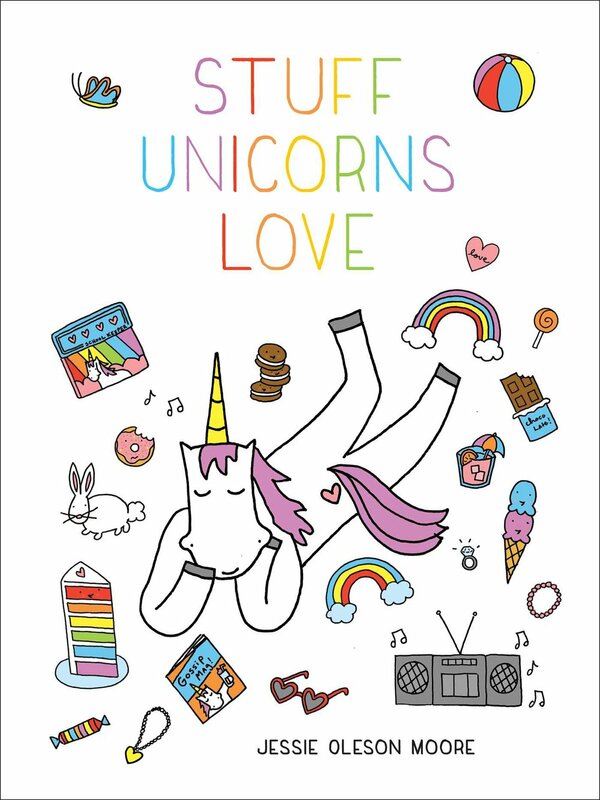 is that it makes your topping and ice cream into a delicious soft-serve slurry. 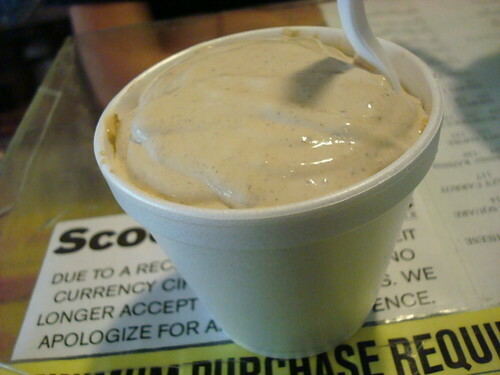 Having chosen the Butterscotch Vanilla flavor, I hit up the staff for a mix-in suggestion. We decided (by committee) that chocolate covered pretzels would be a fine complement. The pretzels were pulverized in the machine, and lent a little chocolate studded saltiness to the dreamy ice cream. I think we made a very good decision indeed. I can't wait to return and try more exotic combinations from their combination menu--for instance, the "Abbey Road" (Vanilla ice cream or yogurt, Oreo, Golden Grahams, Nutella and Marshmallow Fluff on top) or perhaps the "Banana Bread" (Maple walnut ice cream or yogurt blended with oatmeal raisin cookie dough and bananas). 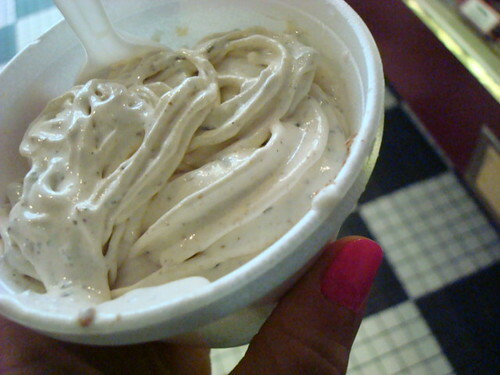 Scoop de Ville, 1734 Chestnut Street, Philadelphia; online here.